Evo & Grace: The WanderLusts: Emotion intense at its finest for Buwan at Baril. Sugid production first theater venture is truly worth seeing, not because of the message that the play wish to convey, but the stellar performances by their powerhouse cast that really bring the house down, this is Chris Millado’s Buwan at Baril sa E(Flat) Major, it opens last Jan 26 and runs up to Feb 12 at Ambassador Alfonso Yuchengco Auditorium inside Bantayog ng mga Bayani in Quezon City. It is very obvious this play is a collection of anti-Martial Law anecdotes, the era that many Filipinos wish never happen to our beautiful country, the portrayal of its five sequence plot is all sad reality, yes it happen and its message is clear, it could happen again with the understanding of current situation happening in our country today. Babaeng Itawis by Angeli Bayani. The play opens with an ambiance with a rally ala in the street feeling, it follows the first story about a farmer and a laborer who happen to be brothers in blood, and brothers in principle, whose fate unite them during a protest in the street. This opening story is such a heavy one to absorb, but still you will understand the harsh reality. The next part is about a Priest and a native girl fom Itawis clan, this is so moving and somehow will make you angry, I have to credit Angeli Bayani performance here, it is something beyond you can expect, her eyes are really talking and at par really. JC Santos as a Priest is refreshing somehow but you will feel the comfort at his heart. Third leg is a solo monologue act called The Socialite, done with flying colors by no less than Jackie Lou Blanco, this is the light part of the play and the balancing of all the performances, actually it is the thinking aloud part where you will think, yes I do care about my country. Ang Asawa by Cherry Pie Picache is on the fourth leg, as we all know how powerful delivery Ms. Picache can act, but her performance somehow is the most crucial, it is her acting that is subtle and slow pace yet full of emotions ready to outburst anytime, yes you will feel her pain. Last segment is about an activist that was arrested by a Police officer, the interrogation process is fun, hilarious yet scary, but it’s a good ending for this play, Ross Pesigan charm on stage adds to my excitement as the student. During its launching, Director Andoy Ranay point the reason why they choose this 1982 born street play by Millado, the message is somehow related to what Martial Law years and to the present situation, wherein innocent lives is at stake in the name of campaign against drugs. Millado is now the Vice President and Artistic Director of the Cultural Center of the Philippines, Cinemalaya Festival Director, a playwright, director and educator. As far I am concern in one event in CCP, Millado said that Buwan at Baril is also set to be stage in CCP within this year 2017. 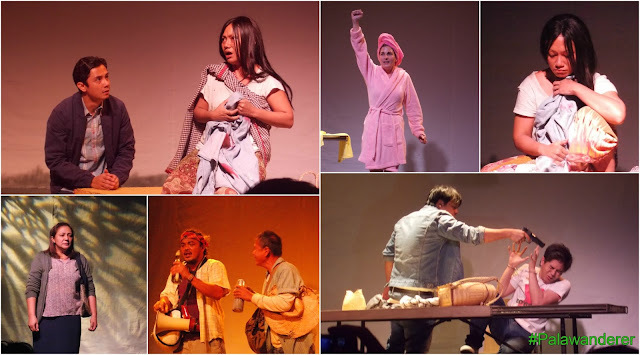 Other cast in this intense and moving play are Crispin Medina, who happen to be the original cast member wayback, Danny Mandia, Joel Saracho, and Mayen Estanero. Tim Cada, Poch Gutierez and Vincent De Jesus provide the live music, while Gwyn Guanzon and Riza Romero provide the costumes. Buwan at Baril sa E(Flat) Major opens last January 26, catch the remaining shows this Feb 9, 10, 11 and 12 (3pm and 8pm). For tickets inquiries pls call or text Gian Viatka of Sugid Productions at 0917-845-6200. The Cast and Director of Buwan at Baril sa Eb Major.